And the second quote is from Appendix F, where Eldar is said to refer to the three kindreds who sought for the Undying Realm '... and came there are the beginning of days, save the Sindar only' Meaning (as I take it) the Eldar are those Elves who passed Oversea, plus the Sindar -- basically the West-elves -- with the Sindar making it to Beleriand, a very 'Western land' of course, in ancient days. ... as I doubt the intended meaning here does not include those Elves who passed Oversea! Wherein Amroth, a Sindarin Elf... is seemingly golden haired! You'll forgive me if I pass over the hair length debate entirely... I'm rather weary of it. Some more Tolkien work from last summer to today: Going for more detail, more ornamental, sometimes softer. "He's not here." Maglor and Celegorm come to the site where Maedhros was ambushed and realise there are worse things in this war than being slain. "Utúlie'n Aurë" - Maedhros and Maglor and their host at the beginning of the Nirnaeth Arnoediad, done as a header for my blog. Incidentally, I've got a lot of tutorials, walkthroughs and ramblings on my blog, if you'd like to take a peek. I'm working on this one at the moment: "Noldolantë". Nice to see you back with new Tolkien illustrations! GoldSeven wrote: You'll forgive me if I pass over the hair length debate entirely... I'm rather weary of it. Understandable -- but how about a longer-haired Maedhros just to spice things up? I was just about to formulate an acidic reply to that... when I realised that the pic I was going to post contains just that - a long-haired Maedhros. So, enjoy him while you can (until I plaster the place again with short-haired incarnations of my favourite Noldo). GoldSeven wrote: I was just about to formulate an acidic reply to that... when I realised that the pic I was going to post contains just that - a long-haired Maedhros. Well that was easy then. Thanks! Very nice! Perhaps I should ask Mr. Howe for a dark-haired Legolas and a 'wingless' Balrog too! And plaster away! but you switched length for some reason, and I think you are now on the path to more long-haired depictions of the mighty Maedros in the future. Hmm, unless you're trying to imply that Elves might cut their hair -- and that, say a thousand years later, it can grow long again afterwards? That's too confusing! and cutting Elven hair ain't attested neether, that I recall (except for Galadriel), not even for the stringing of Elven bows necessarily. John Howe tells a story that he sent a fan an original sketch, as requested, and the fan ultimately replied with (something like) 'thanks, but I really wanted...' and went on to describe some battle scene. So can you do the red-brown a little browner too? But not too brown! Gaaaaaah. This is all your fault. I hate myself for caving in like this, but... I like him like this. And for some strange reason I can't fathom, he's still Maedhros. Thanks Rowanberry... yes, looking at the various pictures this cutting of hair looks like the work of Morgoth or his forces! How dare they cut any russa from Russandol! GoldSeven wrote: Gaaaaaah. This is all your fault. I hate myself for caving in like this, but... I like him like this. And for some strange reason I can't fathom, he's still Maedhros. This is very nice GoldSeven. Did you just do that since my last annoying post? If so you're good and fast! Yes, go to bed every night henceforth, feeling the blame! I did that one in the course of an hour. Half an hour's drawing and half an hour's tweaking colours in Photoshop so it was discernible again. And it's official as of today, I guess. 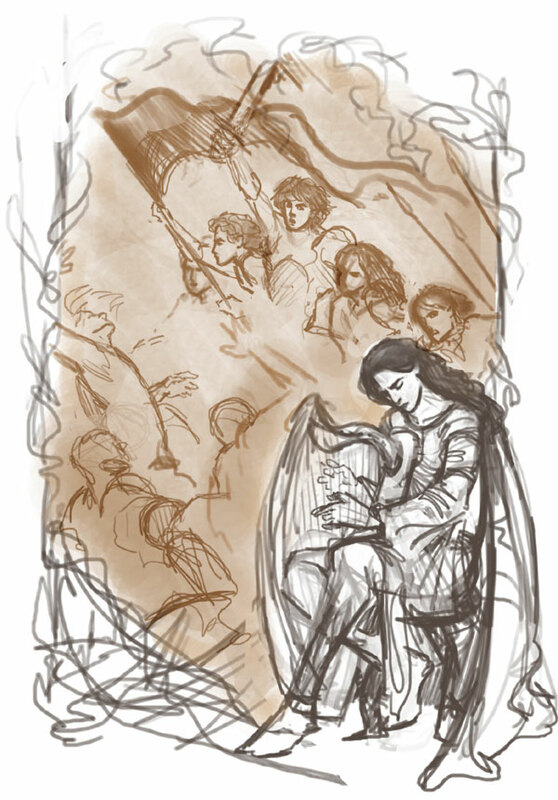 I'd been planning to do a similar piece, with Maedhros standing in front of the hill of Himring, and while I was sketching... he got long hair. After Thangorodrim. So there. I just popped in to see how that Tom Bombadil and Goldberry series was coming along only to find that Jenny is still working on the passing fancy that is The Silmarillion. Certainly she knows that fad is almost over, right? Most things of this nature pass after 35 years or so. The next day at the hour of sunset Aragorn walked alone in the woods, and his heart was high within him; and he sang, for he was full of hope and the world was fair. And suddently even as he sang he saw a maiden walking on a greensward among the white stems of the birches; and he halted amazed, thinking that he had strayed into a dream, or else that he had received the gift of the Elf-minstrels, who can make the things of which they sing appear before the eyes of those that listen. 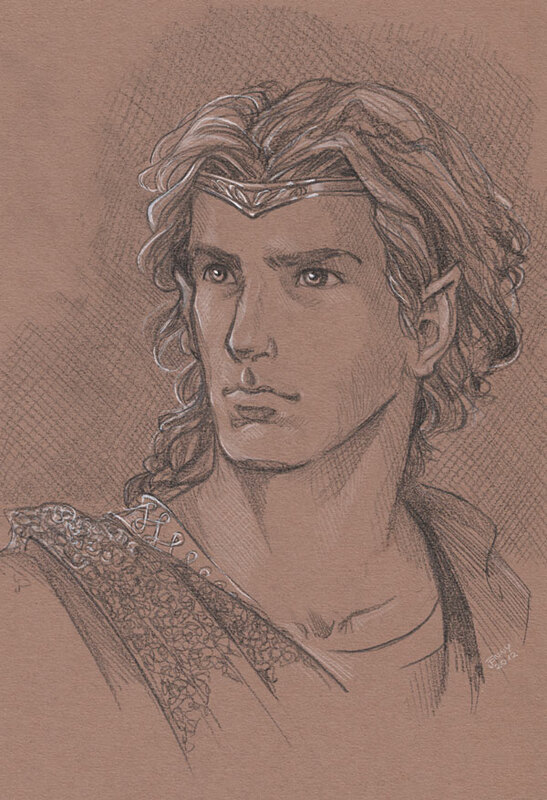 This recent depiction of Maedhros reminds me a bit of Richard Gere. Not at all. As my wife likes to point out, Richard Gere has beady eyes, while Maedhras definitely does not. Their eyebrows are very different as well. But not at all, not 'a bit' as I say? the parts below the unbeady eyes maybe? There's a thread on books that reminded me of this thread-- someone was saying how the Silm dragged for them. It did for me, too-- until I was drawn into the story via some of the artwork I saw on this forum, especially in this thread and a few others. I think I'm going to bump a few threads to plug the Silm! I'm seeing this pictures and they are all great, full of imagination, painting skills and all...Obs: Their faces are awesomely done!!!! But there is one thing that I can't understand. Why are all this NOLDOR or Eldar in general being drown so skinny ??? 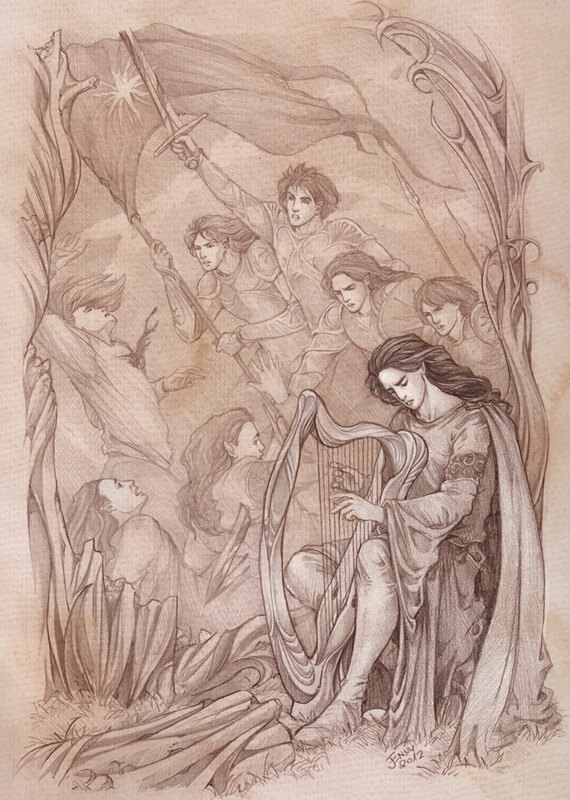 “…and they were tall and dark-haired and strong like fir-trees, and from them most of the Noldor later were sprung. 'The Quendi were in origin a tall people. The Eldar (...) they were in general the stronger and taller members of the Elvish folk at that time. "The Loremasters also supposed that reference was made to the hair of the Sindar. 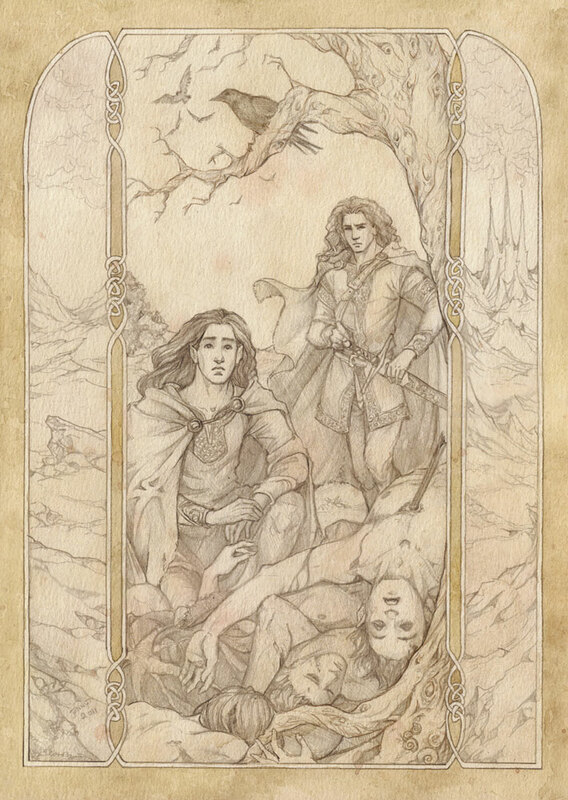 Elwe himself had long and beautiful hair of silver hue, but this does not seem to have been a common feature of the Sindar, though it was found among them occasionally especially in the nearer or remoter kin of Elwe (as in the case of Cirdan). In general the Sindar appear to have very closely resembled the Exiles, being dark-haired, strong and tall, but lithe." The History of Middle-earth, vol. 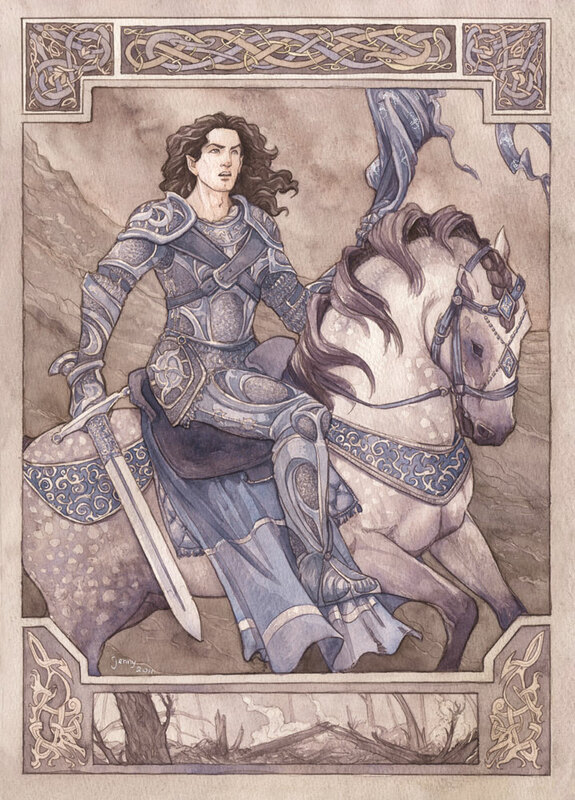 XI, The War of the Jewels: "Quendi and Eldar,"
"The Númenóreans ... are in constant communication with their ancient friends and allies, either in the bliss of Eressea, or in the kingdom of Gilgalad on the shores of Middle-earth. They became thus in appearance and even in powers of mind, hardly distinguishable from the Elves..." - Numenoreans are pretty large guys and if the Eldar are similar to them then they can't be skinny at all. But in the dim dusk of a winter's day there appeared suddenly among them a man, as it seemed, of great bulk and girth, cloaked and hooded in white; and he walked up to the fire without a word. - This is Beleg and he's a Sindar, the Noldor are bigger mainly their princes and let's not forget that the mans who saw beleg were from the house of Hador mainly(all tall and broad). Maedhros or Maitimo(mother's name): "well-shaped one" - he was of beautiful bodily form. - In my opinion he can't be freaking skinny to have a perfect and balanced body. Celegorm or Turkafinwe(father's name): "strong, powerful (in body)"
"...of Feanor, great in mind and body beyond the measure of the Eldar." Curufin or Atarinke: "little-father" - referring to the physical likeness to Feanor. 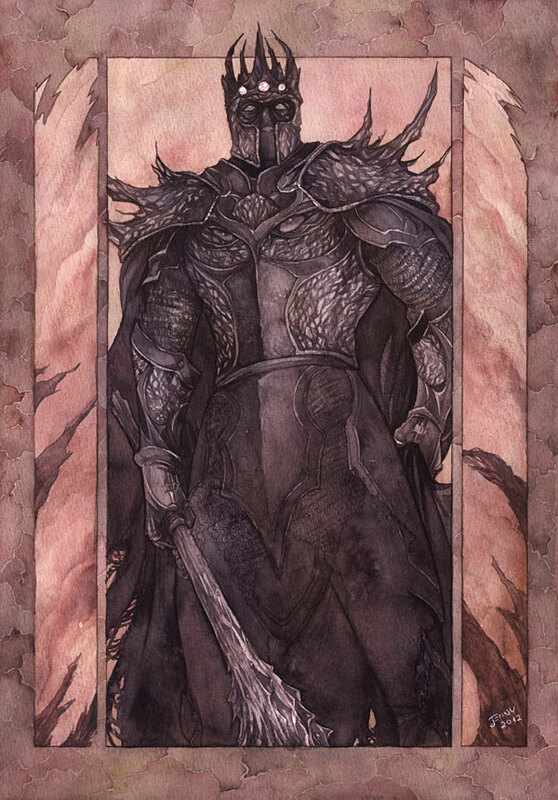 Fingolfin was said to be even stronger than Feanor in some passage. These are awesome. Some of my favorite Silmarillion art I've seen! Ancalagon wrote: I'm seeing this pictures and they are all great, full of imagination, painting skills and all...Obs: Their faces are awesomely done!!!! In general the Sindar appear to have very closely resembled the Exiles, being dark-haired, strong and tall, but lithe." The History of Middle-earth, vol. XI, The War of the Jewels: "Quendi and Eldar,"
Strength doesn't imply being ridiculously muscle-bound, especially when you have the likes of Legolas running over snow - you're not dealing with a human physique. "Lithe" carries with it the implication of slender elegance.